Virtual Paintout - Cesky Krumlov! 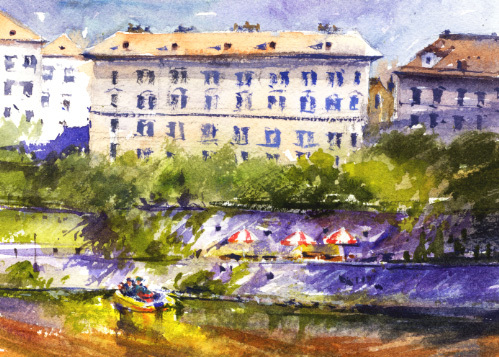 The Virtual Paintout for May 2015 was Cesky Krumlov in the Czech Republic. 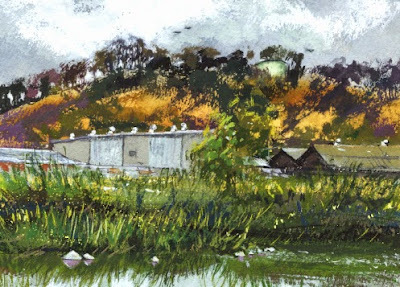 Bill Guffey chooses the monthly Virtual Paintout location from all over the world, anywhere Google Street View vehicles have covered. Artists virtually walk and drive around the chosen location to find their views to paint. 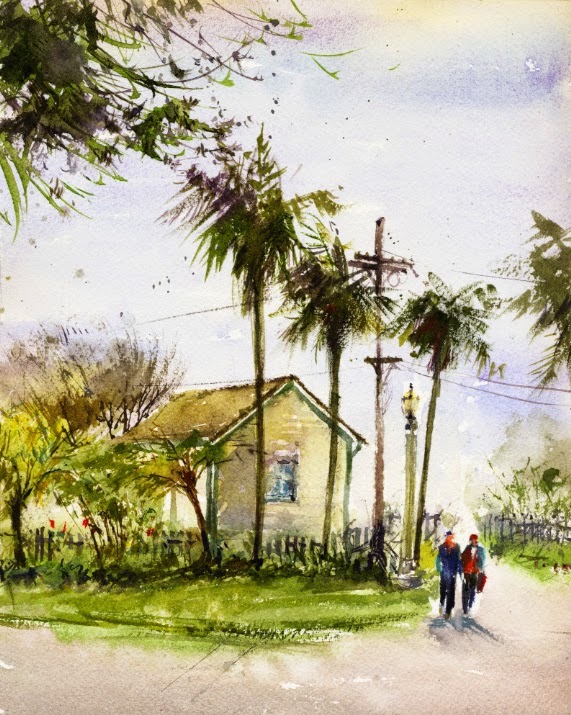 Bill generously posts the artwork on his blog and on Facebook. Since I won't be able to personally visit most of these locations I really enjoy browsing around virtually. I especially like looking around with a painting in mind. Cesky Krumlov is a small but amazing city with a beautiful river and castle. It also has a museum dedicated to painter Egon Schiele who lived there. 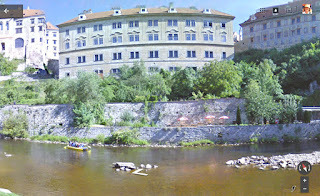 The river that winds through the city appears to be very popular for kayaking and rafting. It was hard narrowing down the views to two to paint! I was lucky to be able to take a recent workshop from Frank Eber. 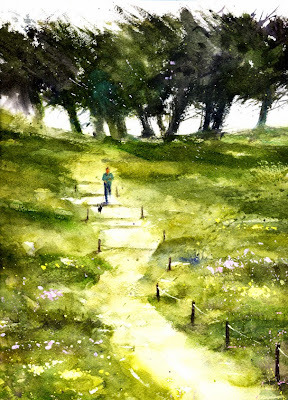 I took a class from Frank three years ago which was before I started plein air painting and had little confidence. I was really hoping another workshop with Frank would come my way. It finally happened, a three day workshop at the National Watercolor Society headquarters in San Pedro. The first day, after watching Frank paint, we all tried a coastal scene from one of his photos. A fun scene, lots of green. In the afternoon, from Frank's photo, we started a pastoral scene with a barn and cows. Frank loves to paint cows and he had a big board illustrated with basic cow shapes to share. The next day we met at the Pt. Fermin Lighthouse. The morning started out cloudy but cleared up and we could add some sun to our paintings. We watched Frank paint morning and afternoon demos which turned out so beautifully and were so inpsiring. 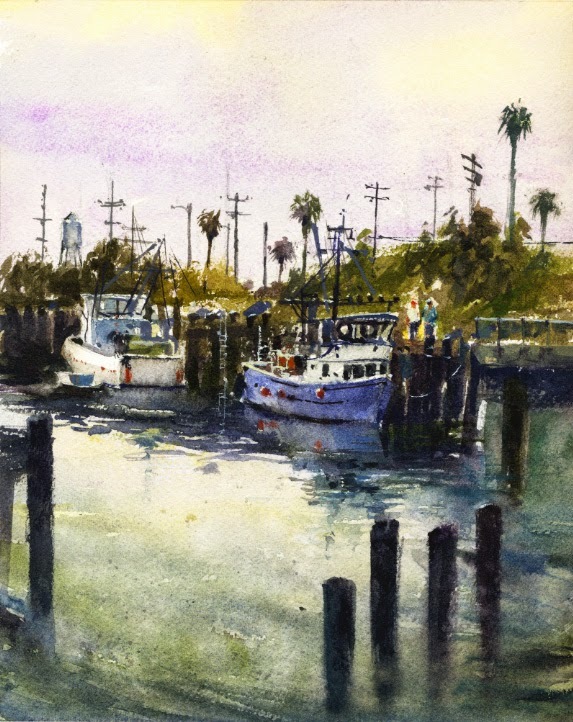 The last day we all met at the channel next to Ports O' Call and tried a harbor scene. There is no shade at that location so lucky for me it was overcast. My boats and water still need practice. We all chose our views and Frank painted another wonderful piece. We went back to the NWS studio and Frank advised us on finishing our pieces. My barn and cows aren't finished yet. This workshop was such a wonderful experience, and Frank is so generous with his tips and guidance. So much fun! A few weeks ago it was exciting to visit a new to me plein air location for the Saturday paint-out. It was a very dreary and overcast morning. Our destination was a horse ranch which looked terrific with many views for possible paintings. 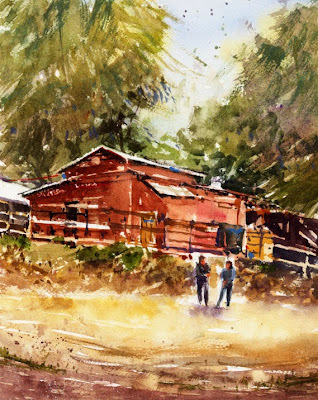 There was a wonderful old red barn, many horse stalls and corrals. A few colts looked out at us from nearby stalls. It's away from major streets, near some hillside horse and hiking trails which was a very quiet and relaxing atmosphere for painting. A young girl and her Arabian horse were having a lesson and I enjoyed eavesdropping while I painted. I didn't add a horse to my watercolor and I had to leave out some fences. Maybe I'll try a horse next time. Yesterday the Saturday paint-out group met at Vincent Lugo Park in San Gabriel. Not an ordinary park! It's home to La Laguna de San Gabriel a children's playground of giant, whimsical, cement sea creatures. The animal sculptures were created by artist Benjamin Dominguez. La Laguna and its sculptures are a state landmark and are being restored. We weren't aware ahead of arriving that it happened to be the exact 50th anniversary for La Laguna. Opening Day was May 16, 1965! The last time we painted at the park it was very quiet but not for the 50th celebration. There were city officials, old photos, music, a big cake, and even a drum line. I remembered on my previous visit Ollie the Octopus had a broken tentacle and was fenced off from climbing kids. It was great to see he's been restored. 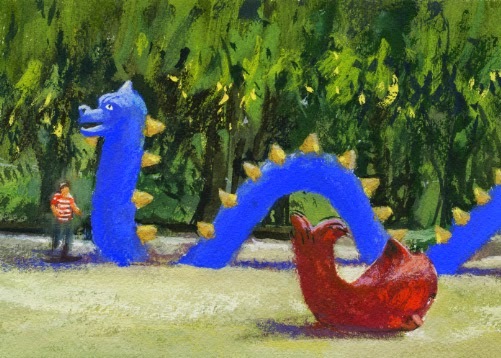 I tried a pretty fast gouache piece since it was a hectic day at the park. 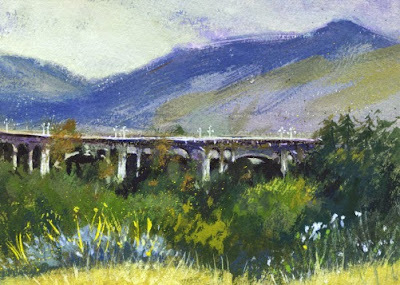 I'm really enjoying painting with the new plein air group that meets at various locations along the Los Angeles River. The L.A. River has been going through revitalization and is becoming beautifully restored. 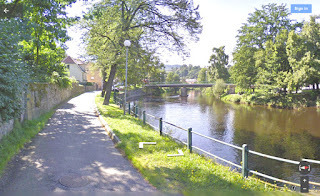 The river locations always seem exciting to me. 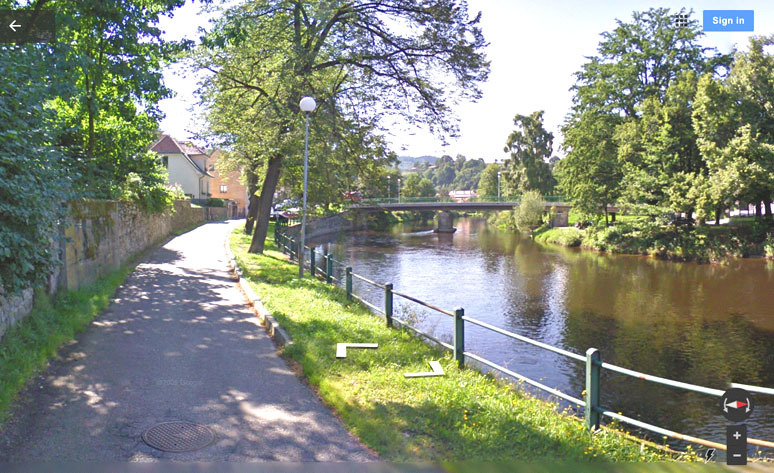 Very peaceful watery scenes but also usually accompanied by noise from a nearby freeway. Somehow the freeway sounds are okay when I'm painting at the river. My previous paint-out with the group was at Bette Davis Park and I posted that watercolor in Bette Davis Park. It was fun to meet up with them again at a non-descript area near Rio De Los Angeles State Park. There was no shade so I was lucky the morning was overcast and dreary. To add some interest to my painting I was also happy to see some warehouse type buildings across the river and a water tank on the hill. 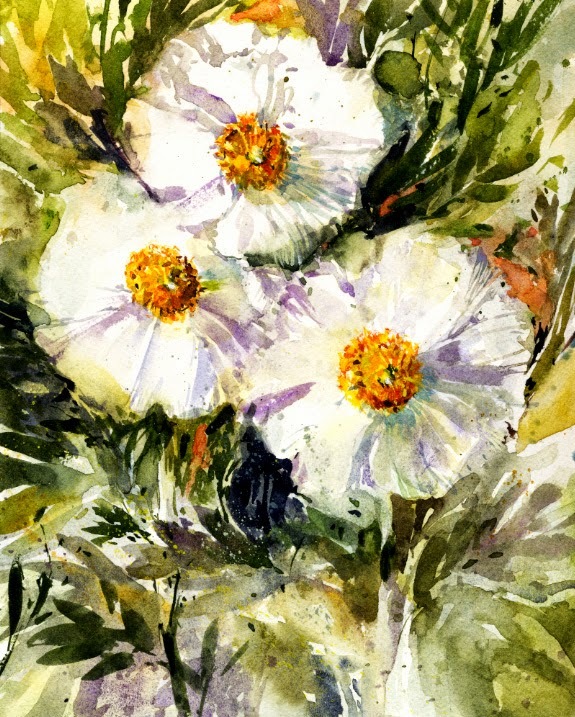 It's Mother's Day so I think some beautiful Matilija "fried egg" poppies would be appropriate to post! I've tried to paint these poppies quite a few times. 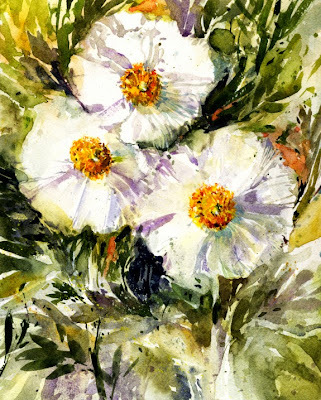 The plein air painters love Matilija blooming season and we're lucky to have some nice plantings of them nearby. My latest post about them was More Matilijas! These Matilijas were blooming at Eaton Canyon in Pasadena. It's a large nature center and there are usually several school buses of visiting kids on field trips. Volunteers guide small groups of children through the nature trails. While painting, I've overheard lessons on a few subjects like poison oak, lizards, and snakes. I was painting these poppies near the picnic tables where a guide was sharing a small gopher snake with the kids after they ate lunch. You can see a couple fellow painters in the distance. Sometimes artists are interesting for the children to watch too and we have an audience! Yes, the historic Colorado Street Bridge. This graceful, curving bridge, built in 1913 is a landmark in Southern California, spanning the Arroyo Seco in Pasadena. For obvious and unfortunate reasons the bridge was and still is known as Suicide Bridge. The most recent tragedy was just last year. Pasadena Heritage closes the bridge for a festival every summer. Of course it's a popular filming location for commercials and TV shows. The bridge is also a very popular subject for plein air painters. I've been putting off trying to paint it since it looks complicated to me. All those arches! 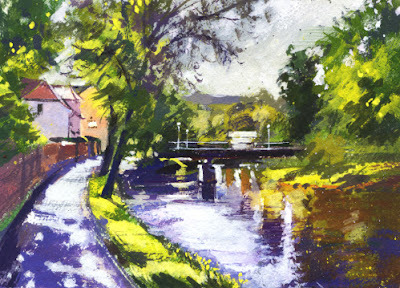 Last week one of the paint-out groups met at a small park with a nice, distant view of the bridge. I decided to give it a try in gouache since I can do some adjusting with that opaque medium. I also liked the pretty weeds in the foreground! 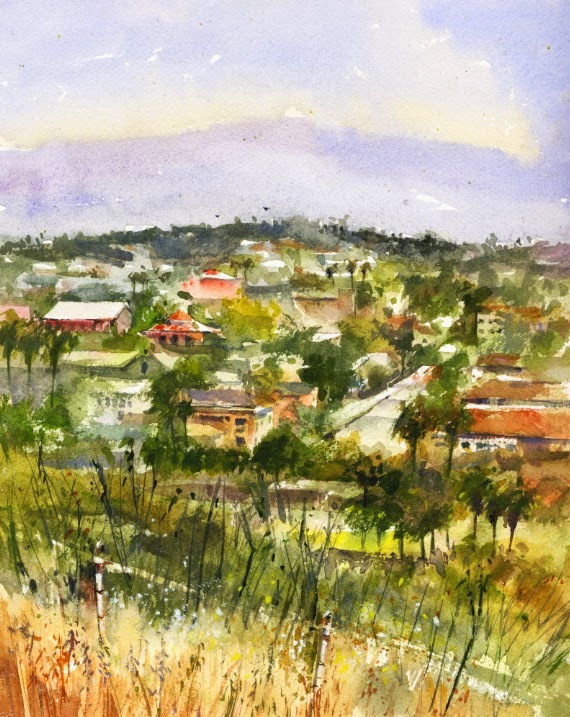 On my third paint-out visit to the Southwest Museum in northeast Los Angeles I tried another watercolor from the hilltop. The museum is located in the neighborhood of Mt. Washington and has a convenient picnic table under a tree in the parking lot. I've sat at the same table to paint from twice before. I posted my previous piece in Valley View. That watercolor is looking east and I liked the way it went. On our recent visit, the mountains to the north looked hazy which is something I like for a watercolor. Wanting to try another bird's eye view from the parking lot, my picnic table spot was perfect! p.s. Just noticed this is my 300th blog post. Pretty exciting!